BLS International: Visa Processing Services to several Diplomatic Missions Worldwide. BLS International is a trusted partner for visa processing services for over a decade to several Diplomatic Missions worldwide. BLS has evolved the entire system into a seamless process which includes information dissemination, automated application and appointment systems help lines, collection and remittance of fees, biometric enrolment and convenient value-added services to enhance applicant’s experience. Over the last few years, our technology-driven innovative solutions have revolutionised the way visa & passport application services are managed. The company offers a broad suite of service offerings designed to securely manage visa applications and issue visas, e-visas and resident permits. These services are streamlined in visa application lifecycle while providing flexibility for customization for each client. The company has expertise in establishing exclusive visa application centres on behalf of the mission. BLS has established state-of-the-art customized visa application centres to make the applicant’s experience pleasant. BLS International plays a key role in client acquisition facilitating and attracting visitors and migrants to its client governments, which includes providing general information about visas and citizenship enquiries and support, providing accessible information in response to specific enquiries by prospective and existing applicants. Communicating effectively with existing applicants about their applications, Payment calculating and handling payment of the visa application charge and other fees. 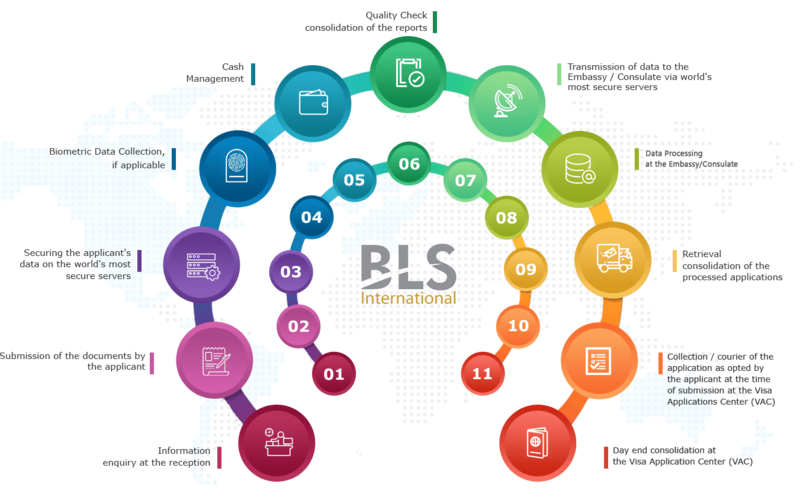 BLS ensures Identity assertion, collecting biometric and biographic information about an applicant and ensures it meets the Governments' quality requirements. Amongst key services provided are entering provided information into processing systems (which involves manual data entry in the current state for paper-based applications) information verification, ensuring complete and correct information has been provided, and requesting additional information when supplied material is insufficient or incorrect.